I have had the one from Tobermory in my collection since 1998. 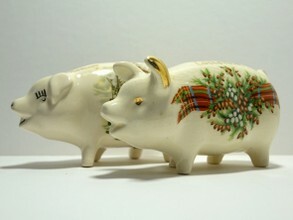 A special one, because it has a hallmark: “Made in Scotland by West Highland Pottery Co Ltd. Dunoon Argyll”. The recent addition is a souvenir from Lockerbie. The same mould but different ears. The one from Lockerbie has a special notion because of the remembrance of the Lockerbie disaster with PanAM fligt 103 in 1988. Date of the banks: ±1960. 15 cm.